World of Final Fantasy features the Mirage Keepers, a duo formed by brother and sister Lann and Reynn. They lost their memories, but perhaps recapturing the mirages might help them. The starting town is almost devoid of life, aside from a few useful creatures who not only help you make sense of the current situation, they accompany you during your journey to assist you in many smaller ways. Tama is the main one; others, like Serafie and Chocolatte, party up overtime. Serafie can grant you random items or a random fight after a few battles, while Chocolatte runs a shop in the starting area, the inventory of which increases as you progress in the story. Mirages? Or the monsters you battle. You can acquire them, so that they might fight alongside your party. Upon encountering a new mirage, Enna Kros grants you a prism compatible with that creature so that you may capture it. Note, however, that this only occurs the first time you encounter a particular mirage, and you won’t lose the prism if you fail. The opportunity to imprison arises after you’ve knocked a monster’s guard down; conditions for achieving this vary from monster to monster, so be sure to try different things. The Libra skill can tell you how to capture a specific monster, but only if it isn’t part of a stack. The application won’t recognize if you’re using a controller. Instead, you must manually change the button guide from keyboard to a controller. Also in the settings are options for “maximum gil” (Final Fantasy current for gold), “no encounters,” and a few other options to speed up progression. The “no encounters” option comes in handy if you’re dealing with a puzzle and don’t want the distraction. You may change the settings to speed up battles and dialogue and also even further speed up both of these with a fast-forward option that you may either hold or toggle. Welcomed as well is the option to fast-forward battles. Especially as they evolve in their embrace of typical turn-based combat which at times, I think we can all agree, gets repetitive... A feature that staves off this tedium is “stacking.” You may construct four stacks total, two for each of the two characters, but only use two within a battle. Each stack consists of a large, medium, and small character or mirage. You may stack a small mirage directly on top of a character in their “jiant” (large) form. The stats of the stack derive from the individuals in the stack. Likewise with the abilities the stack can use. For instance, if two mirages in one stack have access to the spell “Fire,” you may cast “Fira” as the stack. Beware of enemy attacks that can topple your stack--you’ll have more fighters to control if this occurs, but they’re stronger together in the stack. The composition of a stack--between stats, abilities, elemental strengths and weaknesses –will prove either helpful or disastrous during boss battles. If your stacks are constructed well, a boss can be a breeze; otherwise, you might die or just barely survive. Though, early on especially, it’s easy to level up faster than the zone can follow to the point that I found myself one-shooting enemies leading up to a boss. The boss is then easy enough to allow for a constant barrage of abilities, until you either kill the monster or run out of Attack Power (AP). AP regenerates during a battle, so if you do run out, just attack for a turn or two until you have enough to use another ability. Overleveling poses a problem if you missed a mirage, as you’ll have to create an opportunity to catch it during the encounter (often by reducing the monster’s HP), but killing it in one hit gets in the way of doing just that. Fortunately, some mirages have a subdue ability which inflicts non-lethal damage. Your mirages gain Spell Power (SP) upon leveling, which you may use to unlock spaces on the Mirage Board. Serafie has an item above her head that occasionally spawns and increases the SP of each mirage by one. Filling out mirage boards is possible, but it won’t be achieved quickly. A mirage board allows you to strengthen a mirage in various ways, from increasing particular stats to learning skills that help during battles or out in the field. Blank spaces allow you to insert a skill seed, which in turn allows your mirage to perform a skill it woudn’t be able to use otherwise. You may also buy some of these at Chocolatte’s shop, as unlocking spaces increases the mirage’s sync level and at certain thresholds, that monster obtains a bonus increasing their stats. Certain spaces unlock new boards and transfigurations. The latter allow you to change a mirage’s form, which changes its size and affects the potential stacks. Any large mirage for which you’ve unlocked the joyride ability, you may also use as transportation. Main characters don’t gain SP when they level but they gain additional “mirajewel” slots upon leveling and obtaining key items. These grant character skills and stat increases. 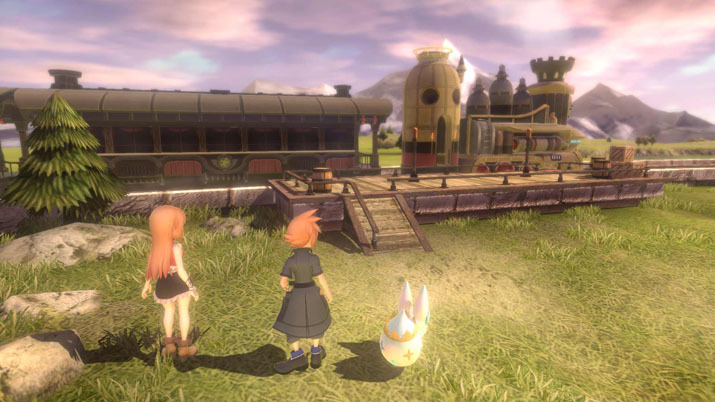 Even though combat is a tad repetitive and the freedom to explore and deviate from the linear progression lacking, WORLD OF FINAL FANTASY remains enjoyable. 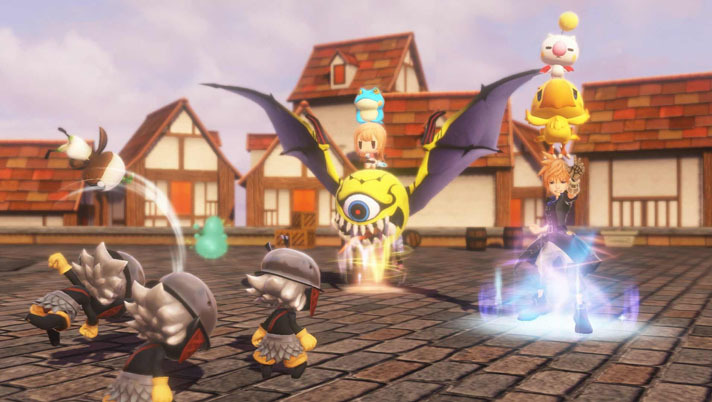 The multitude of mirages to collect and features like "stacking" add much value to gameplay, with the Coliseum and Tearoom going a step further by providing additional battles to tackle. If you’re a fan of RPGs or of the franchise, you’ll want to get this release.